Visual effects projects often hinge completely on one critical piece of technology. Increasingly often, that technology hasn’t been developed or proven yet. Furthermore, if the technology doesn’t deliver, there is no other viable plan to complete the work. The project can’t be done without the technology, and the technology can’t be developed without the project. Given the many unknowns we face in technology development, how can we decide when it is appropriate, or even critical, to take these leaps of faith and embark on projects with unknown solutions? How do we know when to play it safe, or place all of the chips on the table in favor of technological returns? 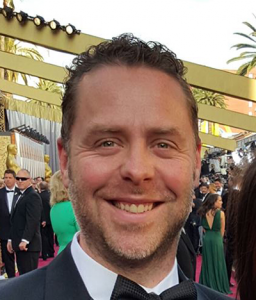 Industrial Light & Magic Visual Effects Supervisor Jason Smith will discuss the challenges and advances in facial performance capture used on the Warcraft film, and the thought process involved in banking on that technology. He will also discuss similar technological crossroads he and other supervisors at ILM have faced on Warcraft and other ILM projects in the past. As a visual effects supervisor at ILM, Jason Smith is responsible for overseeing digital effects for feature films, with an emphasis on digital creatures. Some of his notable projects include Rango, Pirates of the Caribbean: Dead Man’s Chest, and Transformers. He is also a member of ILM’s technology advisory group. In 2012, Smith was ILM’s Associate Visual Effects Supervisor on Marvel’s superhero blockbuster The Avengers. The film went on to gross over one billion dollars worldwide and his character work on The Hulk was nominated for a Visual Effects Society Award. In 2015, Smith’s work as Visual Effects Supervisor on Alejandro Gonzalez Inarritu’s The Revenant garnered him an Academy Award Nomination for Best Visual Effects and Visual Effects Society Award for Outstanding Supporting Visual Effects in a Photoreal Feature. Smith is also a Visual Effects Supervisor on the upcoming film Warcraft. Smith joined ILM in 2001 as a technical assistant, and became a Creature Technical Director in 2003. He is a graduate of Brigham Young University’s Computer Science Program, with a minor in Visual Arts. While earning his degree, he studied traditional sculpture and prosthetic makeup effects, and produced creature makeup effects for university productions. Smith is also one of the creators of Block Party, ILM’s creature rigging system, which automates the time-consuming process of character rigging. Smith also invented ILM’s TFM process used to accomplish the robot transformations in Transformers.